This article is about the special move in Super Mario RPG: Legend of the Seven Stars. For the Super Mario Sunshine level, see Corona Mountain. 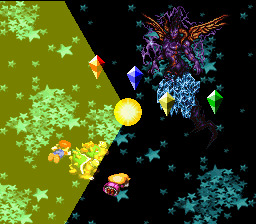 Corona is an attack most often used by boss enemies in Super Mario RPG: Legend of the Seven Stars. When used, Corona will summon a large, yellow orb that will attack all members of Mario's party, doing significant damage. An unused Bahamutt used the Chain Saw attack, which used the Corona animation. "Corona" means "crown" in Spanish and Latin, and the corona is also the extended outer atmosphere surrounding the sun and other stars. Either, or perhaps both of these, could be where the attack gets its name. ↑ Lights JusticeZ. (June 2, 2009). SMRPG - Unused Enemy Spells & Attacks. YouTube. Retrieved July 5, 2018. This page was last edited on July 5, 2018, at 21:49.